Left to right: Track and field official Mary Onken, WVHS freshman Behailu Bekele-Arcuri, WVHS 2016 graduate Megan Reilly, and Warwick track/cross country coach Mike Potter. Photo courtesy of TH-Record. 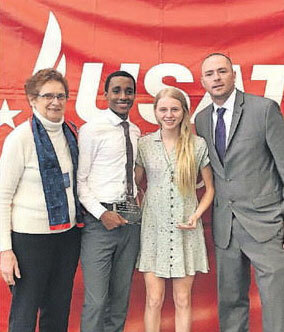 Two Warwick athletes were among four local students honored for their 2016 accomplishments at the USA Track and Field New York Region banquet on Staten Island on Sunday. Warwick graduate Megan Reilly was named the high school female track athlete of the year, and WVHS freshman Behailu Bekele-Arcuri was named the high school cross country runner of the year. Additionally, Giuliana Sadler of Minisink Valley was named the age 15-16 cross country runner of the year. Port Jervis senior Kaylah Quarshie was named the age 17-18 track and field athlete of the year.